Do you ever feel like you are a referee with you kids? While it seems to be natural for boys especially to wrestle around, it’s another thing when they are arguing and bickering with each other. It seems to never end. When you are pulled into the middle of their fight, they expect you to pick a winner and a loser, a no win situation for you. 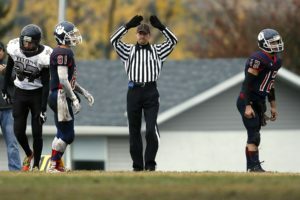 Maybe we should wear referee uniforms and blow a whistle when we see the poor choices our kids are making! I can imagine Jesus felt this way at times. During his last meal with his disciples at the “last supper” Jesus’s students (the disciples) started arguing which of them was going to be the greatest in heaven. Just like a parent, Jesus had to step in and straighten them out. It’s one thing for kids to argue and bicker, but do they also show love to each other? Too many times parents only require their kids to accept one another, which is good, but not best. Best is showing love to each other even when you are mad at them. My (Joey) definition of love is “an unconditional commitment to an imperfect person.” How committed are your kids to each other? Are they more committed to other friends or teammates than they are to each other? I (Joey) remember the day we were in the van and our teenage daughter Briana asked her sister Amy who could reach Briana’s backpack easily to get a book out of it for her. Amy did and the corner of the book was bent. Briana was so upset because her book was bent and began telling her sister what she thought of her for not being more careful. We had to step in and I eventually asked her if her best friend had bent the book would she be upset with her. Briana immediately answered “Of course not.” We waited a few minutes for her to see the irony in her response but she didn’t so we asked her why she wouldn’t respond in the same way. After listening to her friend’s virtues, we broke in and asked her what she was telling her sister. Briana wouldn’t respond because she realized she was telling her sister she wasn’t important to her and she loved her friends more than she loved her. We told her she was going to lose the freedom of hanging out with her friends until she could treat her sister better than she treated her friends. We told her she had to prove to us over time that her siblings were loved and valuable to her. By “over time” we don’t mean a few days or a week or two. We mean at least a month. We wanted loving her siblings to become a habit for Briana. Teaching kids to love properly is a lengthy process because they like us are selfish and self-focused. We are all trying to take care of ourselves and it’s always easier to treat a sibling worse than a friend because your sibling will always be in your life but you could lose friends if they don’t like how you treat them. The best way to stop refereeing you kids is to teach them to love one another just as much as they love themselves and to treat each other the way they wanted to be treated. When you kids are squabbling with each other ask them, “How are you showing love to each other?” if they are self-focused they will likely start pointing out how the other is not showing love to them. When our kids did this, we saw it as a great opportunity to have them sit alone in an isolated place until they came up with a way to show love to each other just like Jesus showed love to his disciples. Look for an opportunity to read to your kids John 13:21-35, reminding them of the story of Jesus demonstrating love to Judas (by giving him Jesus’ piece of bread) and giving us the same command that we must love each other the same way by loving those who hurt and betray us. This can help them deal with friends both Christians and non-Christians who hurt or betray them.